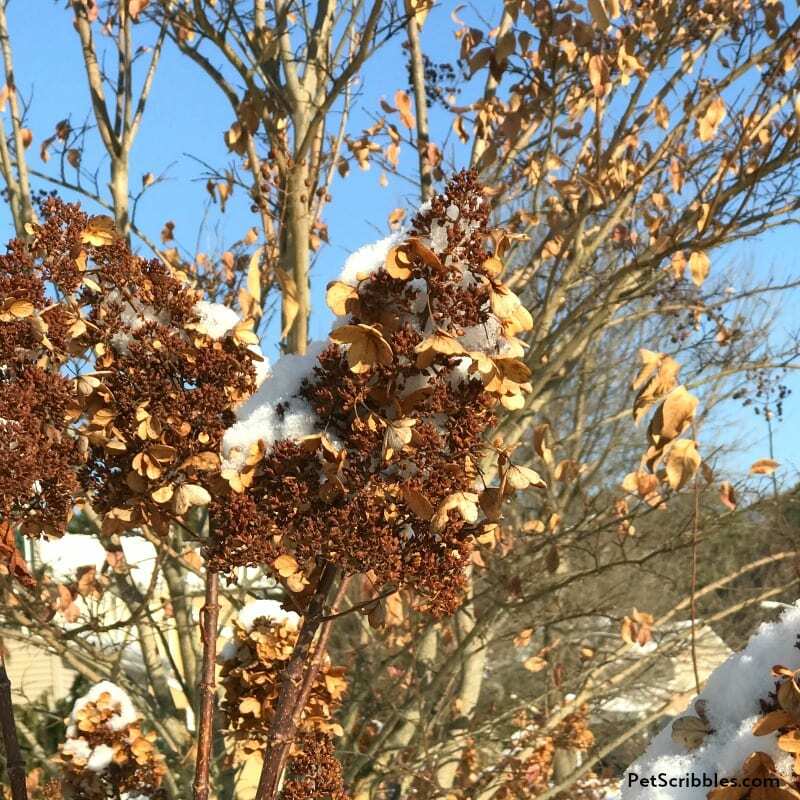 This article — originally on how to prune your Pinky Winky hydrangeas the easy way — has been expanded to include complete Pinky Winky hydrangea care. Think of this as your ultimate guide to successfully grow and enjoy your Pinky Winky hydrangeas! 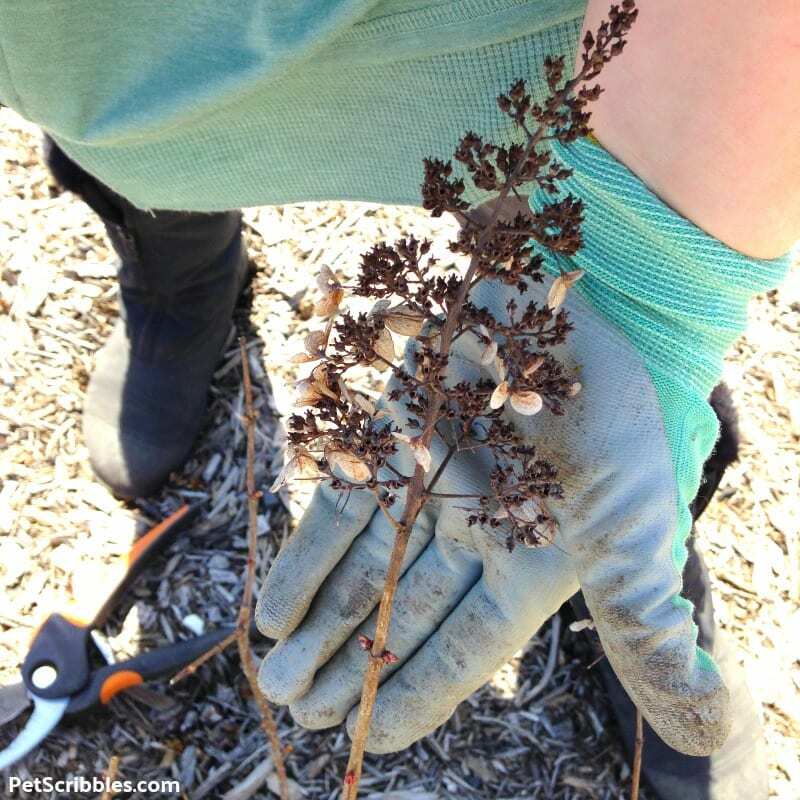 My steps to pruning Pinky Winky hydrangeas the easy way are still included, further down in this guide. 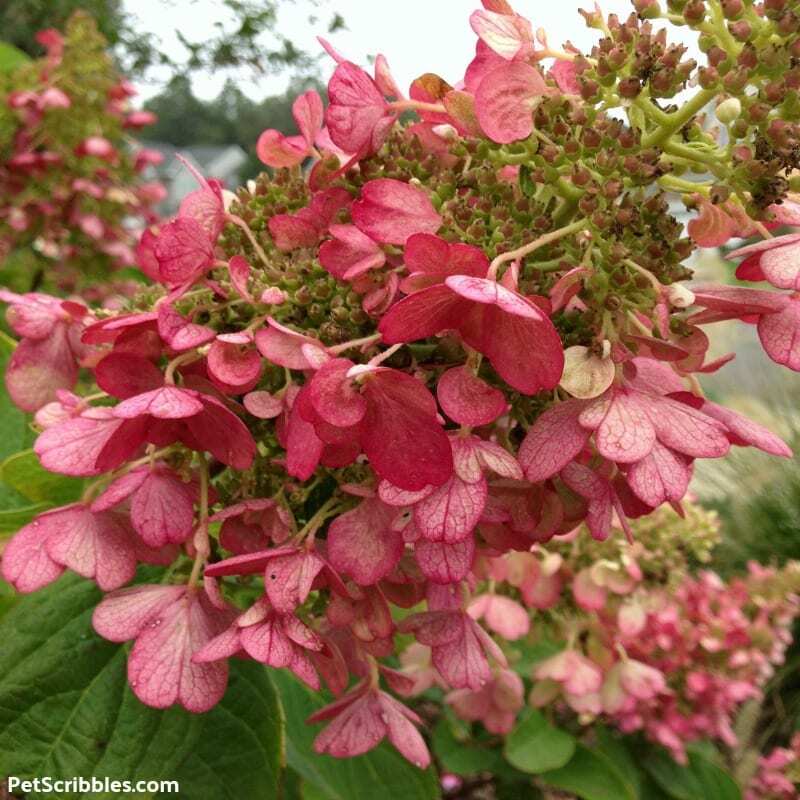 What is a Pinky Winky Hydrangea? Is Pinky Winky Deer Resistant? Pinky Winky is a flowering deciduous (not evergreen) shrub, featuring pink and white flower heads that continue to change color during their lengthy blooming season. 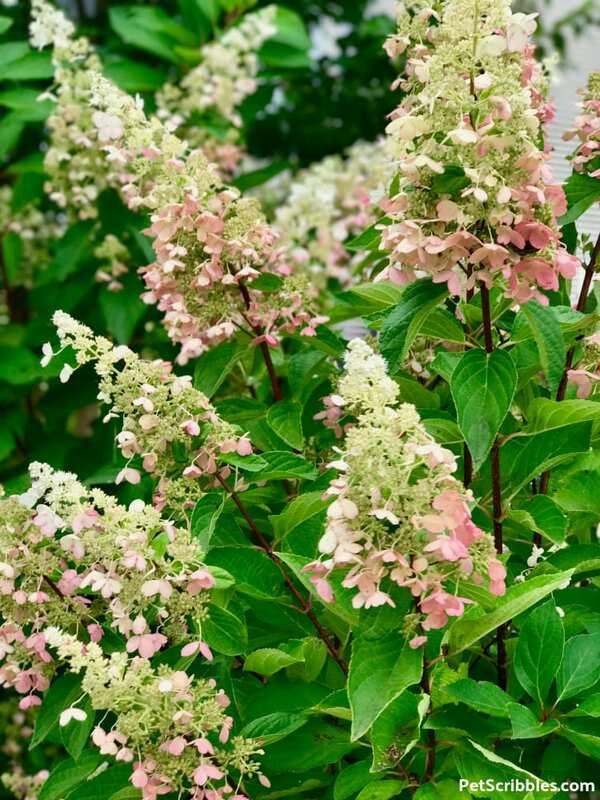 The full name is Hydrangea Paniculata Pinky Winky. 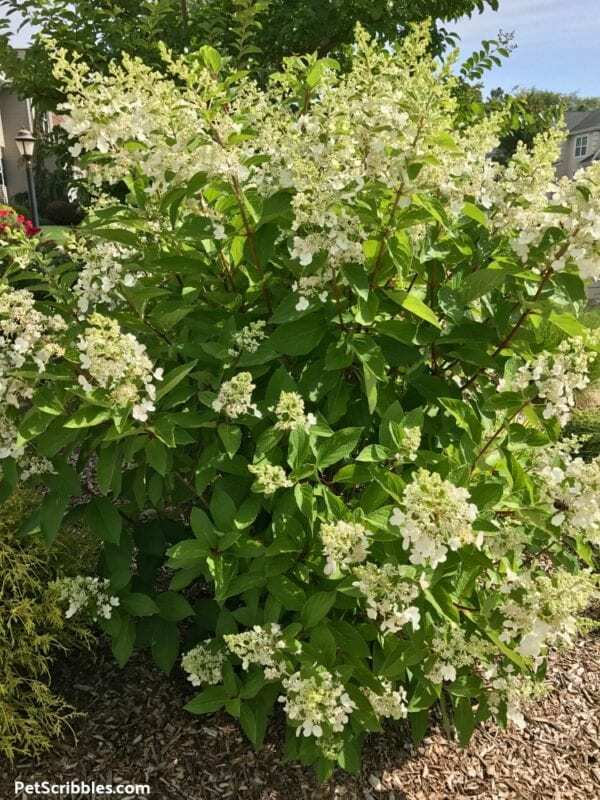 It’s also known as a Panicle Hydrangea, which I’ll explain shortly. 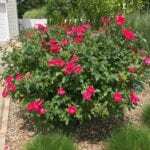 This Summer flowering shrub is easy care, and a fabulous shrub for beginner gardeners because of how trouble-free it is. 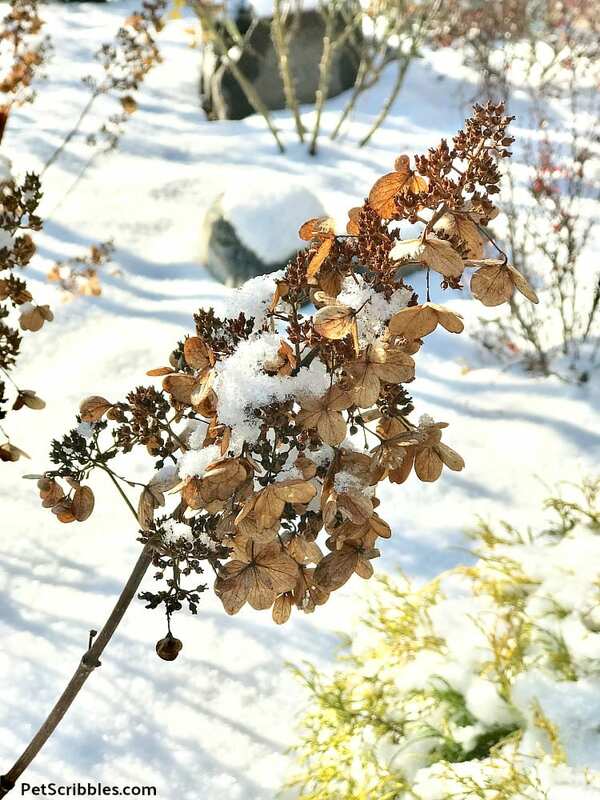 Pinky Winky is one of the best — and hardiest — hydrangea varieties to survive Winter seasons without difficulty. If you want a long season of stunning blooms that continue to change color from mid-Summer well into the Fall season — Pinky Winky hydrangea is what you want! What does Pinky Winky mean? Any time I’m asked what type of hydrangeas these are, I know that as soon as I say the funny name, there will be a follow-up question about it. As happens with many plants, the breeder usually gives his or her new plant a unique name with some meaning — perhaps named after a beloved spouse, famous person, or a favorite color. 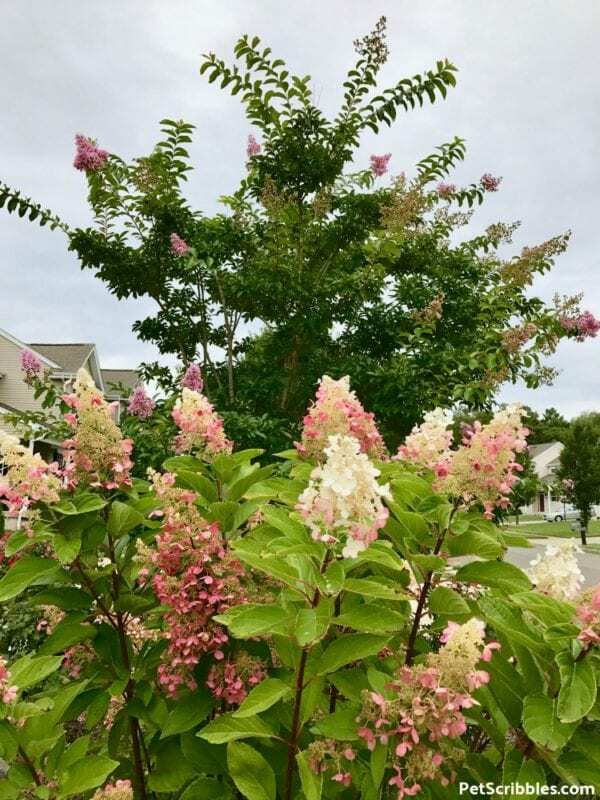 In the case of Pinky Winky hydrangeas, the breeder from Belgium dedicated this shrub to his son, who at the time loved the Teletubbies cartoon, especially the Tinky Winky character. Thus, Pinky Winky became the quirky name! 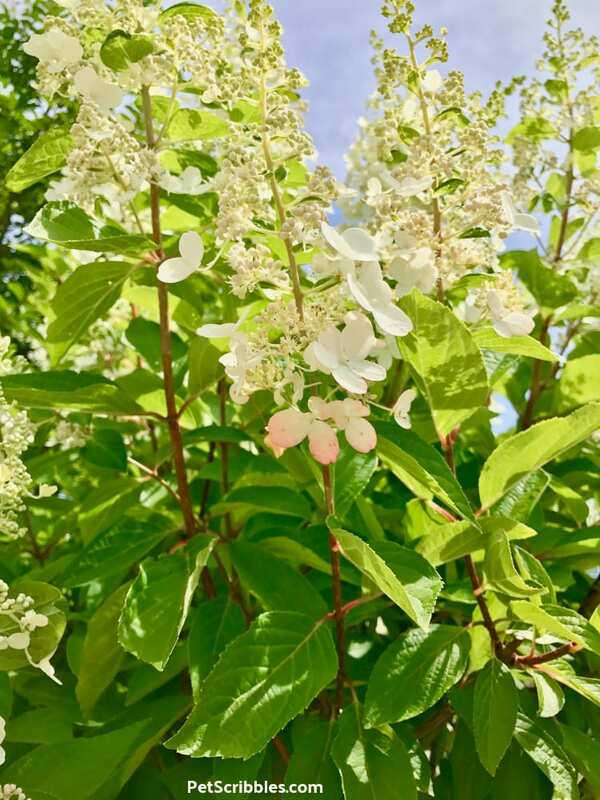 The breeder is Johan van Huylenbroeck, and he also developed the Bobo hydrangea, which I mentioned in my Pia Hydrangea article. Bobo is another favorite cartoon character — a blue rabbit on Belgian television! 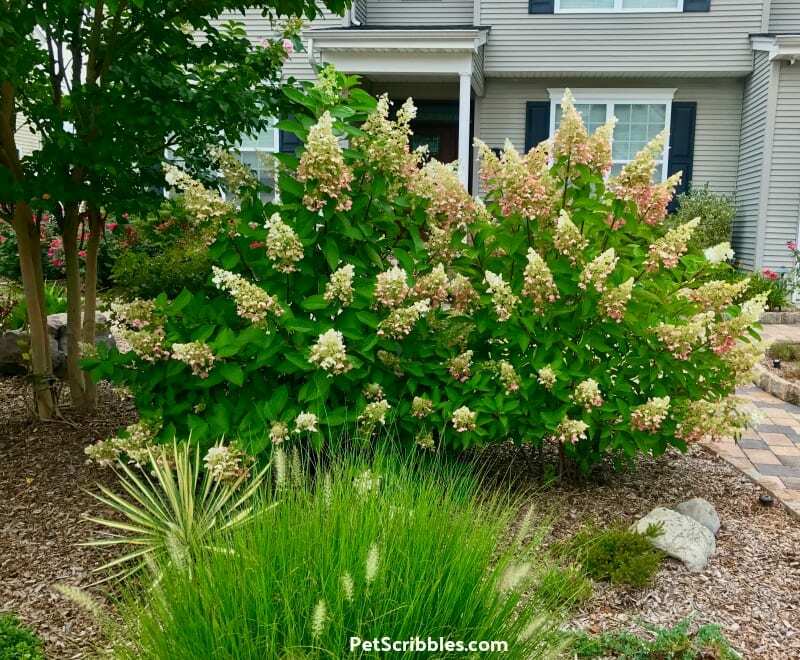 What is a Panicle Hydrangea? A panicle has a main stem, with several smaller stems branching off from it. Each of these stems has many flowers connecting back to each branching stem. 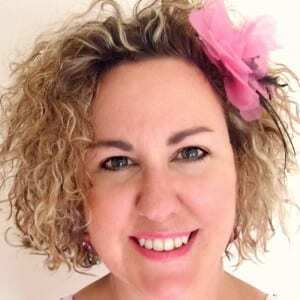 A Pinky Winky flower head is cone-shaped and called a panicle. There are several off-shoots from the main flower stem, each with little flowers making up this one panicle. 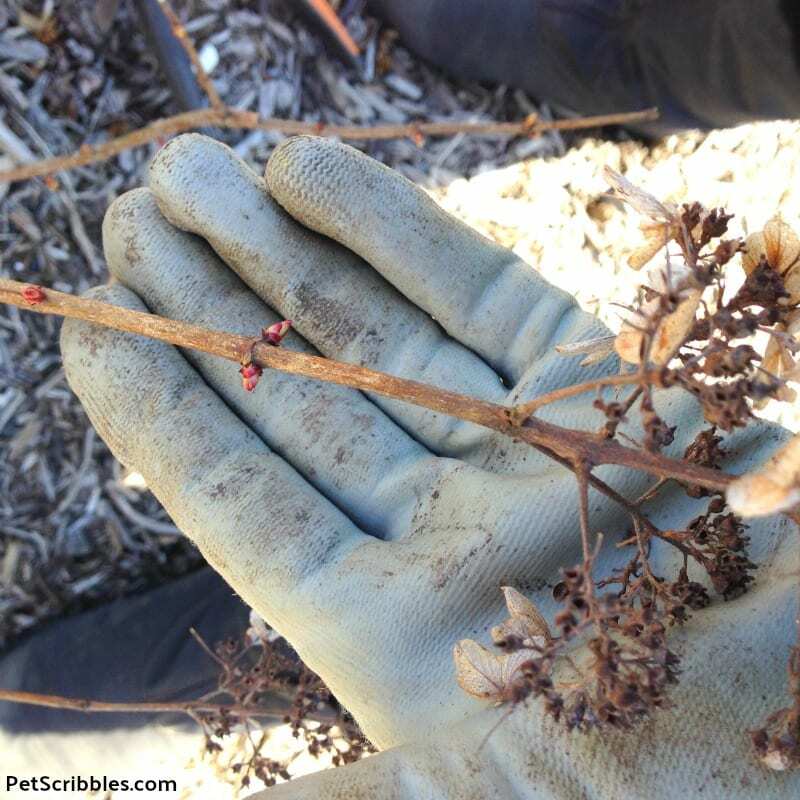 The end of each panicle continues to grow longer during the growing season while producing more flowers along its length. 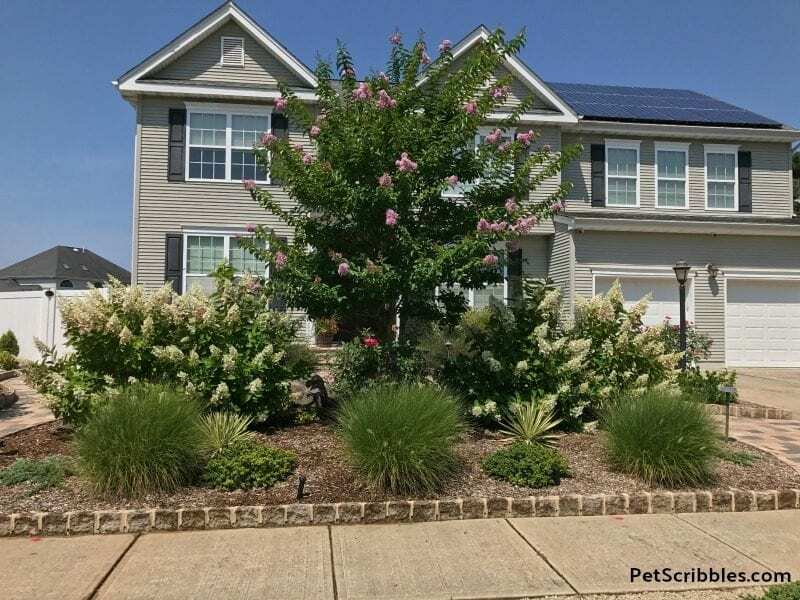 Panicle hydrangeas are considered the most hardy of all the hydrangea species. Unlike some varieties of hydrangeas, Pinky Winky is not fickle about blooming. We’ve had ours bloom after harsh Winters and rainy Springs, and also after a hot, early Summer drought too. This is key, because some hydrangeas only bloom on old wood, or on both old and new wood. Pinky Winky does all of its blooming on new wood, so even if it gets frozen down to the ground, come Spring it will shoot up new growth and all will be well! As we all work to make our gardens more friendly to pollinators, planting a Pinky Winky hydrangea — or two or three — will benefit your other plants and flowers. Plus, I just love the hum of the bees as they ignore me and go about enjoying the hydrangea flowers! Here’s a brief glimpse of the bees enjoying our hydrangea blooms . . . 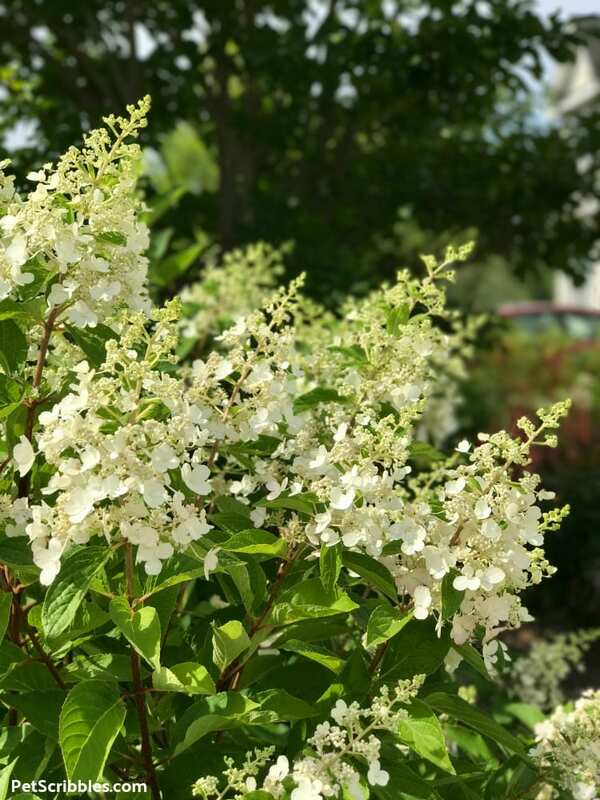 When we first planted our Pinky Winky hydrangeas, I wasn’t aware of the wonderful scent of the flowers, until one of my neighbors mentioned how she enjoys the fragrance on her morning walks. 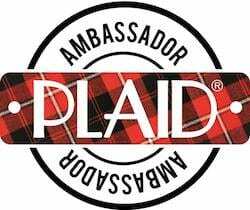 The best way I can describe the scent is spicy with a slight hint of vanilla and honey. It’s not overwhelming. In fact, I find the smell to be calming. 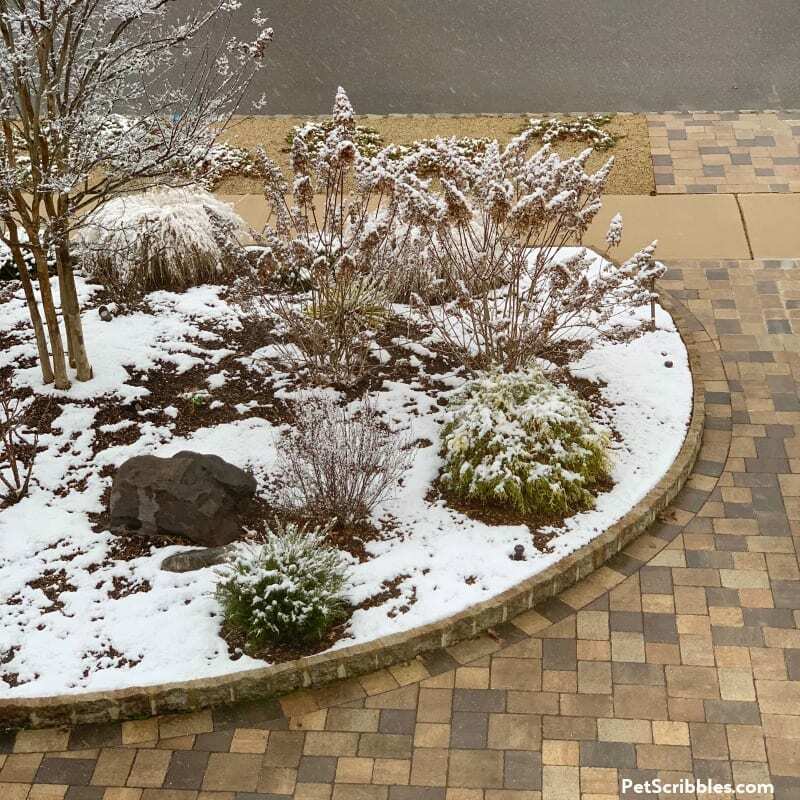 I am a gardener who believes strongly that our gardens can provide four seasons of interest. Pinky Winky hydrangeas add to the serene look of the Winter season if you leave the dried flower heads on the stems. I do this every year. Pinky Winky hydrangeas are less interesting to deer versus bigleaf hydrangeas like the Endless Summer variety. 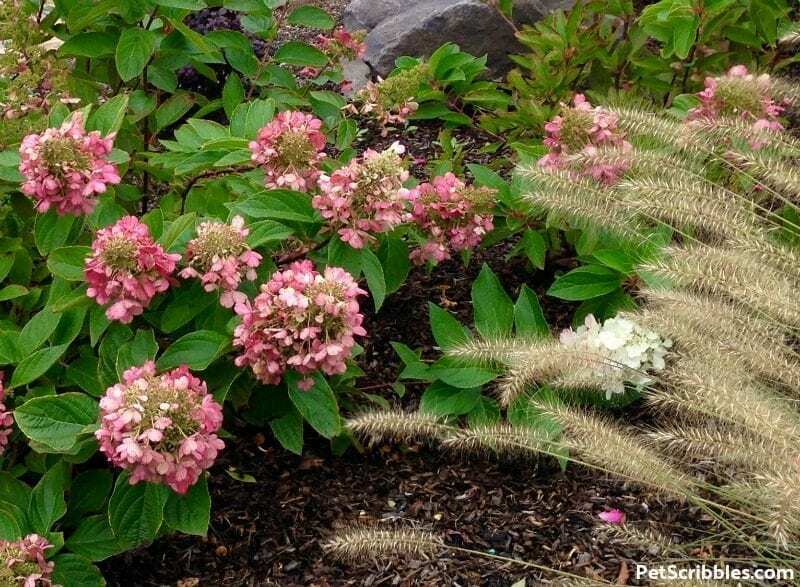 While deer will eat just about anything if they’re hungry enough and their normal foods are lacking, it’s good to know Pinky Winky shrubs are lower on their preferred list of hydrangeas. 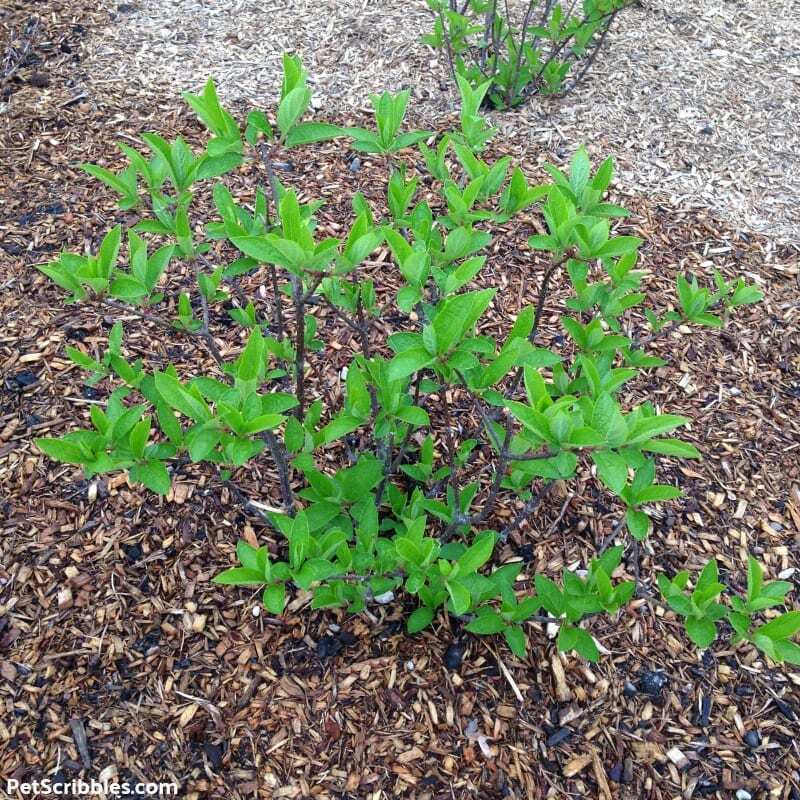 This shrub has a rounded shape, featuring red stems which show up nicely among the bright green leaves. These strong stems never get floppy or weighed down by the large, cone-shaped (panicle) blossoms. In fact, last month we had flooding rains here at the Jersey shore, and the shrubs remained upright! How big does Pinky Winky hydrangea get? 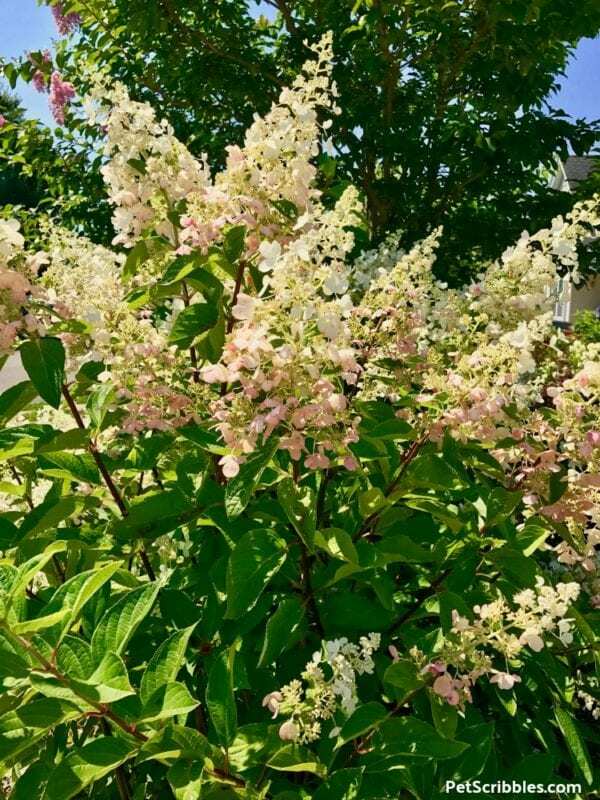 The mature size of a fully grown Pinky Winky hydrangea is approximately 6 to 8 feet tall and wide with a rounded shape. However, these hydrangeas grow as large as 8 to 10 feet tall and sometimes even taller when they are super happy! 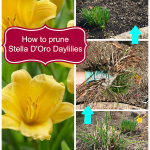 And yes, that’s even if you prune them down each Spring like I do! 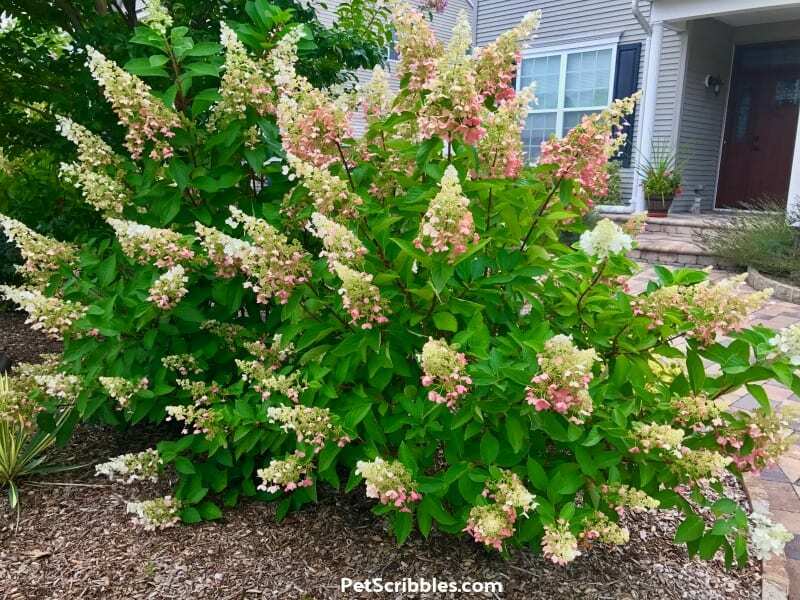 How fast does Pinky Winky hydrangea grow? The Pinky Winky hydrangea growth rate is considered fast-growing, as these shrubs grow up and out by many feet during the growing season. It’s quite impressive! Pinky Winky’s flowers are cone-shaped, as I mentioned earlier. They are considered a panicle, as each flower stem has several smaller branches containing florets which make up the larger, overall flower. Technically, each cone-shaped panicle — which we consider a flower — is actually many flowers grouped together, all connected to the main stem of each panicle. In the image below, notice the arrows pointing to two different types of florets. There are the small fertile florets which looks like little stars, and there are the larger showy sterile florets. It’s the showy florets that change color over their long-blooming season from white to pink to a deep rose. And it’s the small fertile florets that the bees love, after being drawn to the flowers by the larger sterile florets. Fun fact! The large flowers grow 14 to 16 inches in length, and continue growing all season, even while they are changing colors from white, to pink and white, to fully pink, ending with a pretty deep rose color before they begin to dry. Pinky Winky is best known for its pink and white two-tone blossoms, but they don’t start out that way. Pinky Winky flowers are truly amazing because they change colors over a long season of blooming. Flower buds develop as lime green in color, before opening to cream or white flowers. The flowers remain white for most of the Summer. For our garden in zone 7, ours begin turning pink in early August. Are the flowers truly white? Many gardeners say the flowers are white, while some say cream or ivory. My best description is the flower color begins as a warm white, which does appear more ivory to me than white. It’s not the true white of an annual white geranium or white petunia, for example. I think the actual shade of white is in the eye of the beholder. My opinion is a warm white shade. When does Pinky Winky bloom? The flower show begins in mid-Summer with beautiful, white cone-shaped blooms. 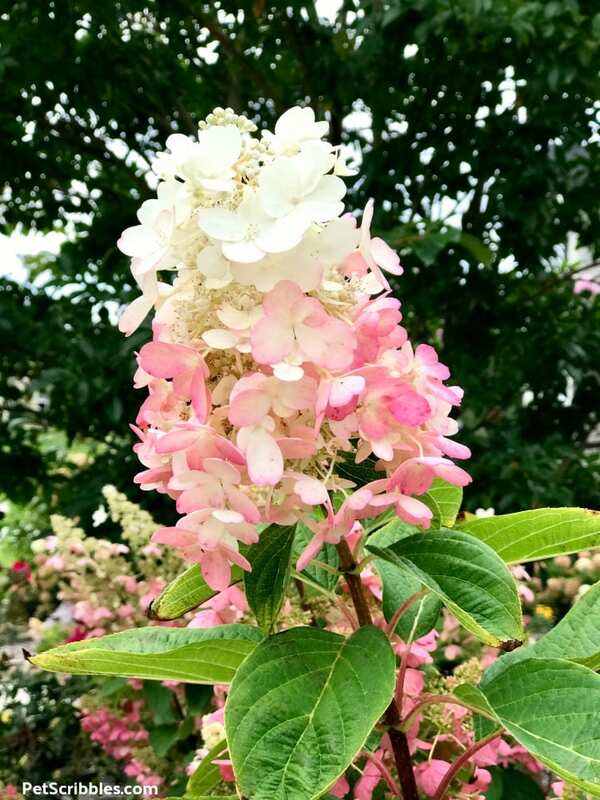 When do Pinky Winky hydrangeas turn pink? These blooms begin to turn pink in August — here in zone 7 in southern New Jersey, starting at the base of each flower head. While the base of the flower head turns pink, the flower head continues to produce new white flowers at the tip. 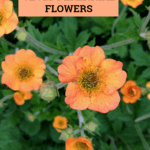 In other words, each flower head continues to grow while changing color! 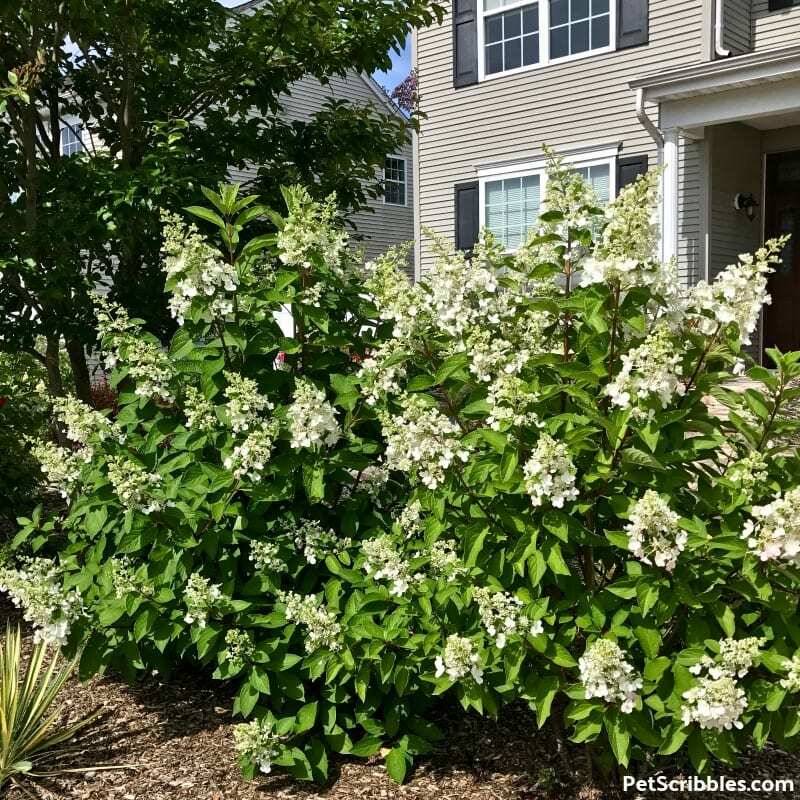 You have beautiful two-toned blooms covering the shrub! The flower show extends into the Fall season as the blooms turn pink in August and change into a stunning rose color that is perfect for Autumn. Best advice: Find a location in your landscape where your Pinky Winky hydrangeas can grow to their full size. Pinky Winky hydrangeas can grow very large, and most of them do! Plant Pinky Winky hydrangeas either in the Spring or in the Fall. 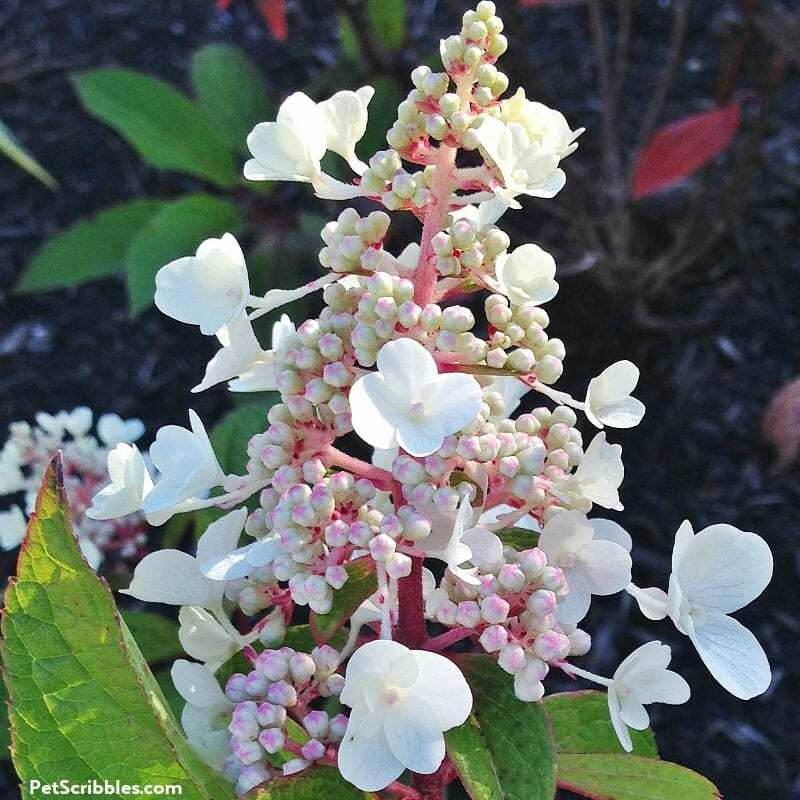 As with most flowering shrubs, do not plant Pinky Winky hydrangeas too deep. Dig a planting hole only as deep as the Pinky Winky is currently planted in its container. Dig the hole a bit wider than the sides [of the container]. Periodically check your work by simply placing the container into the planting hole to see how high or low the plant is. Adjust accordingly with more or less soil. Place the plant into the hole and fill in the sides with more soil. Most garden books and websites will tell you to space your Pinky Winky hydrangeas at least 7 to 10 feet apart. Our own Pinky Winky hydrangeas are planted just shy of 4 feet apart. And they are doing just fine. 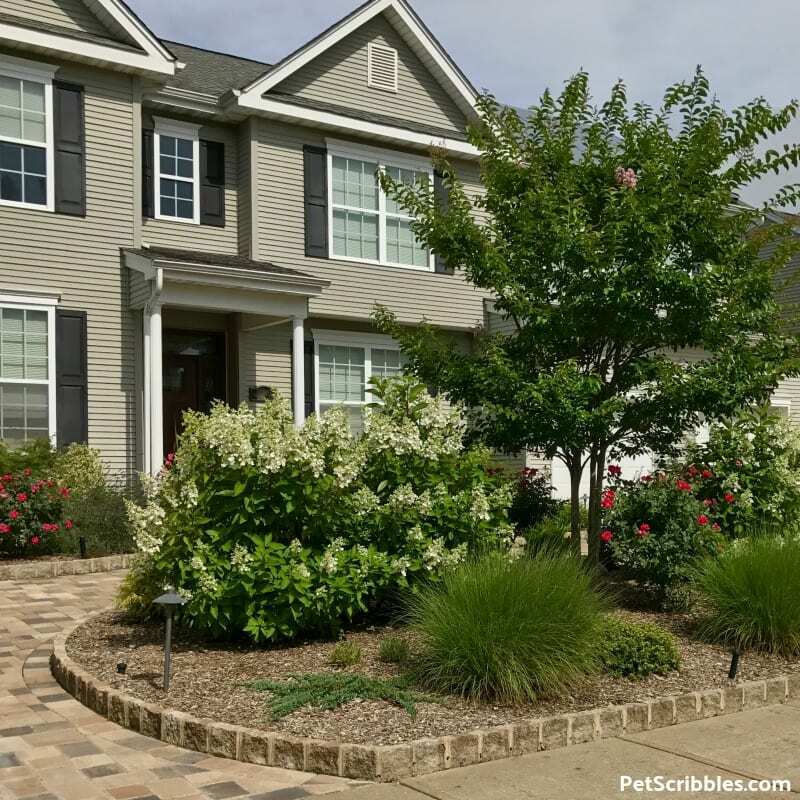 We have two Pinky Winky shrubs planted on each side of our Crepe Myrtle tree. 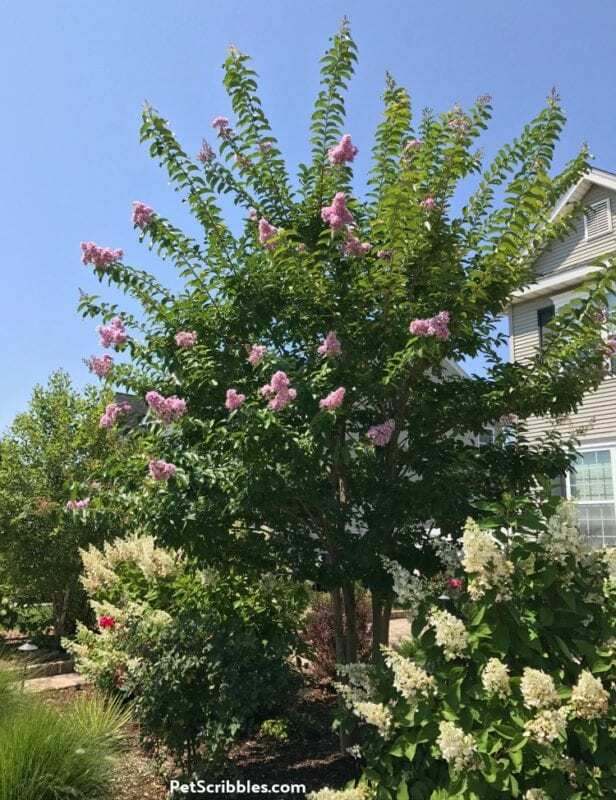 Each set of shrubs slightly overlaps with a few branches every Summer, looking like one gorgeous shrub on each side of the tree instead of two. Can I transplant Pinky Winky Hydrangeas? Yes, you can transplant your Pinky Winky hydrangeas. It is best to do so while the plant is in its dormant stage, with no leaves on the stems. 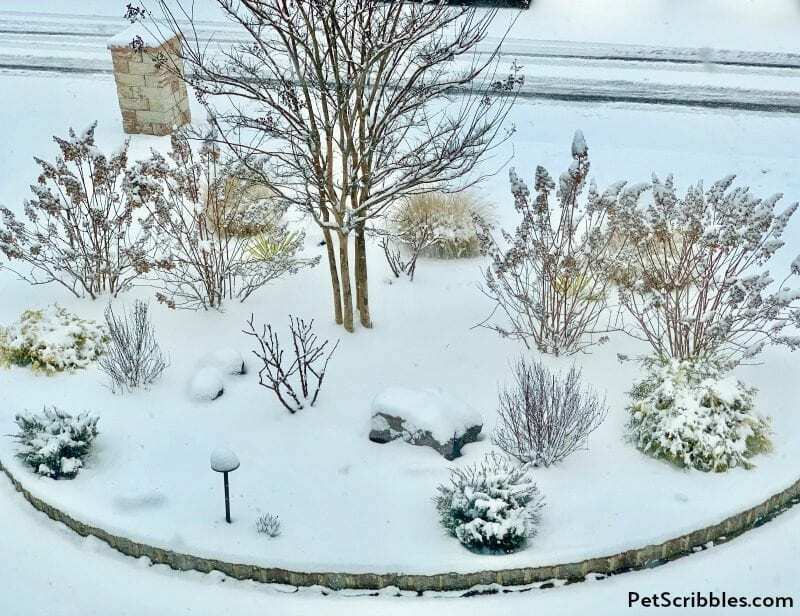 This is usually in late Fall or early Spring. 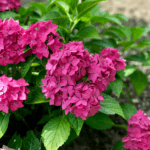 Unlike several other hydrangea varieties, Pinky Winky’s flower color is not affected by the pH of the soil. In other words, the flowers will always begin as white and become two-toned with pink, eventually turning to a deeper rose pink. 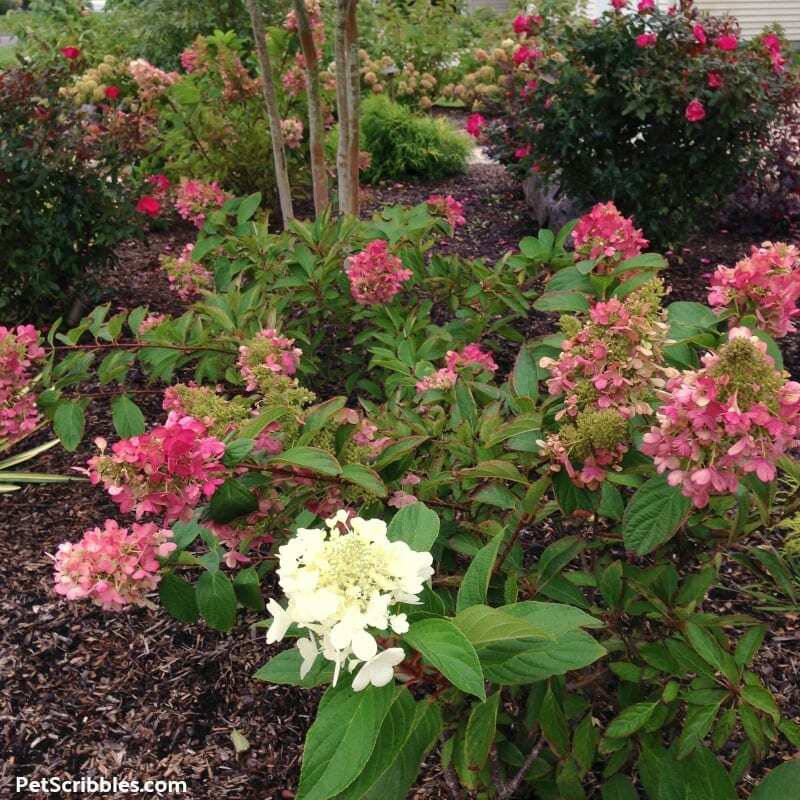 Some gardeners don’t use any fertilizers on their hydrangeas and still have beautiful shrubs with lots of flowers. Do not use high nitrogen-based fertilizers, as this can actually hinder flower production on most hydrangea varieties. Pinky Winky hydrangeas are happiest in either full sun or partial sun. 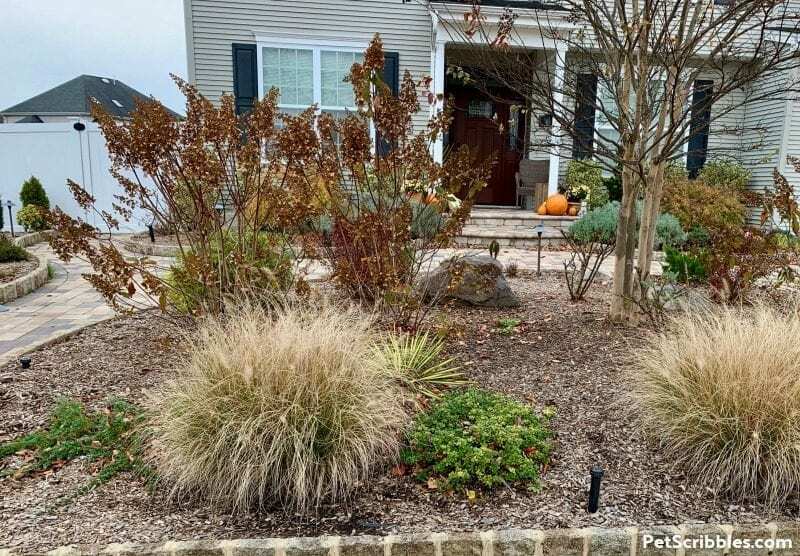 Regular watering is required, especially when the shrubs are in their first year. 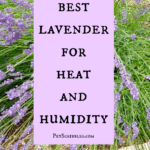 Also make sure to water regularly during the heat of the Summer. 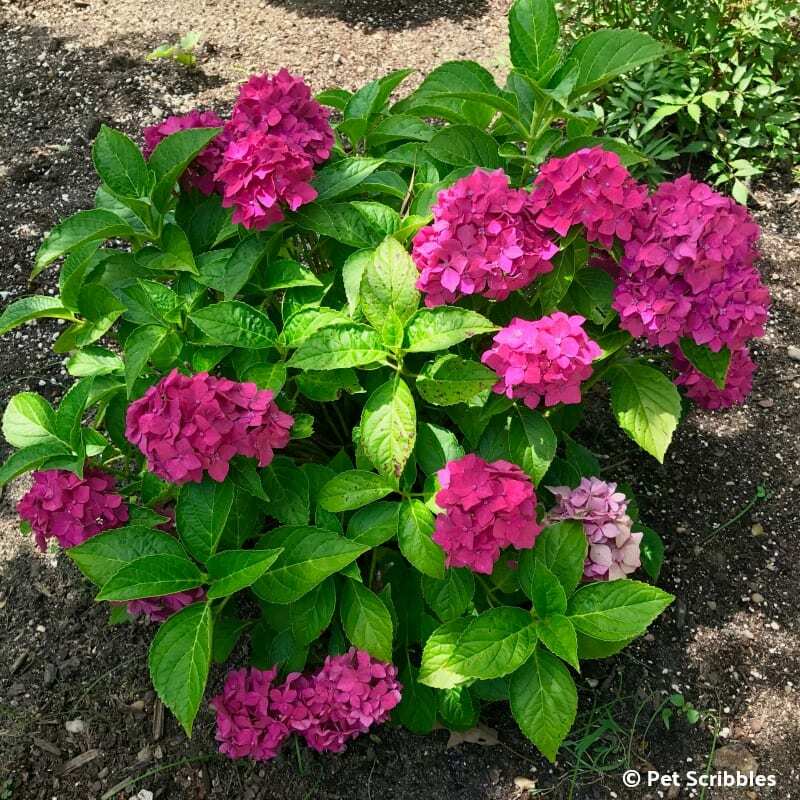 The good news is that once your Pinky Winky shrubs are established, they become more drought tolerant than some of the other varieties of hydrangeas. 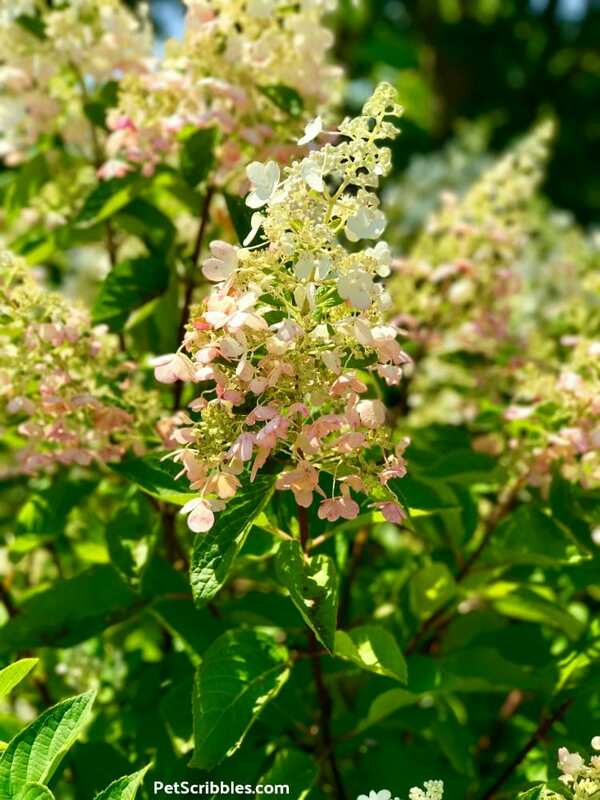 Panicle hydrangeas — such as Pinky Winky and Limelight — are more cold-hardy than other Hydrangea varieties, such as the mophead bigleaf hydrangeas. Pinky Winky hydrangeas are hardy between USDA Zones 3 through 8, sometimes 9. 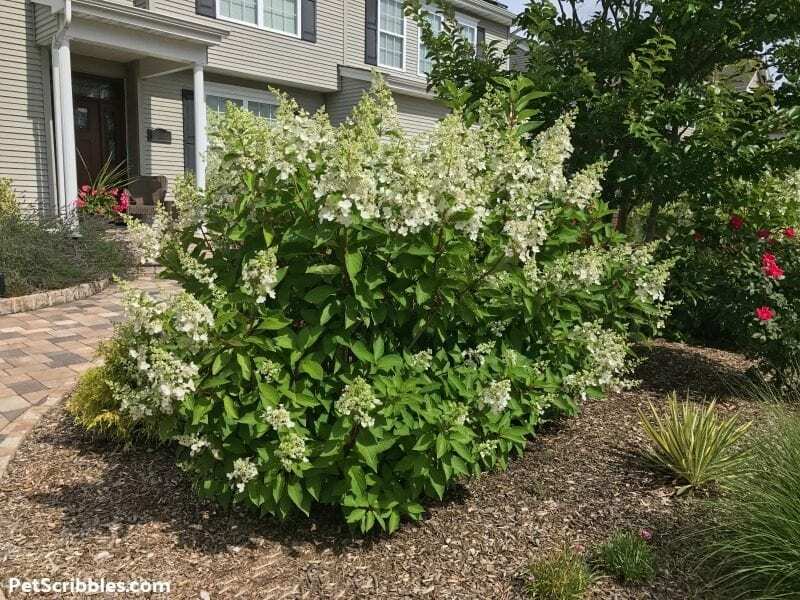 How do you know for sure if this flowering shrub can be grown in your specific zone? 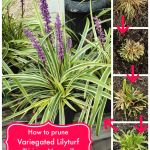 If your local nursery is selling them in the Spring, then they should be good for your local climate. Always ask a nursery expert if you’re unsure. 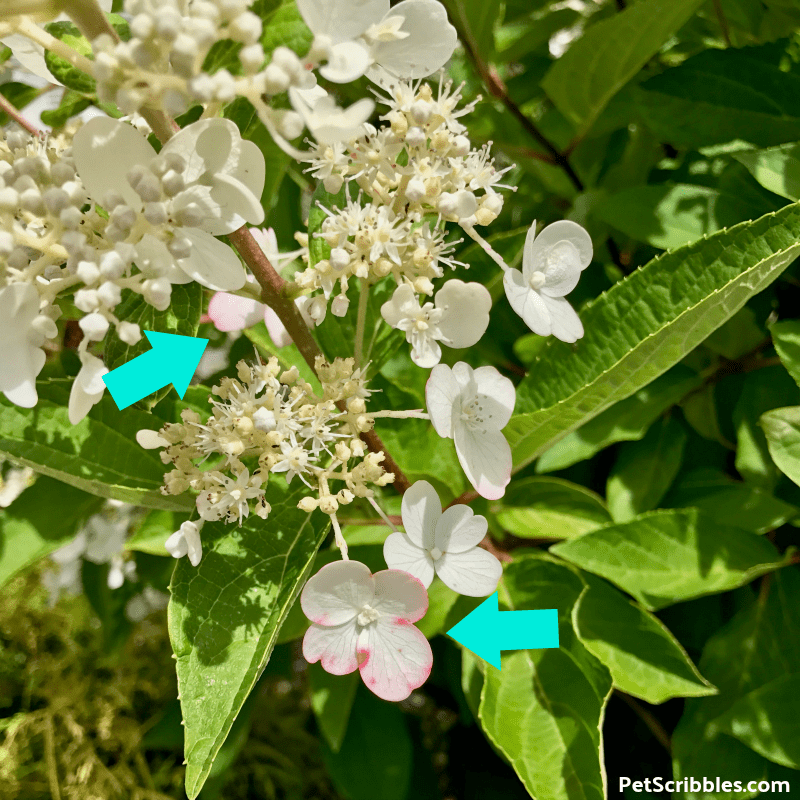 After reading so many how-to’s on the correct way to prune Pinky Winky hydrangeas — and getting discouraged by how involved some of the directions were — I came up with this easy way to prune Pinky Winky hydrangeas — if you need to prune them at all. It can be super-intimidating when researching that new shrub or plant you purchased. Am I right? You planted it in the ground last Spring, and now it’s time to kick-start your garden again. Knowing what to prune — and when — can get overwhelming. So I’m trying to dumb it down for my own benefit, and hopefully help you too! Our Pinky Winky hydrangeas were planted a few years ago when we had our front landscaping completely redone. They are from Proven Winners. 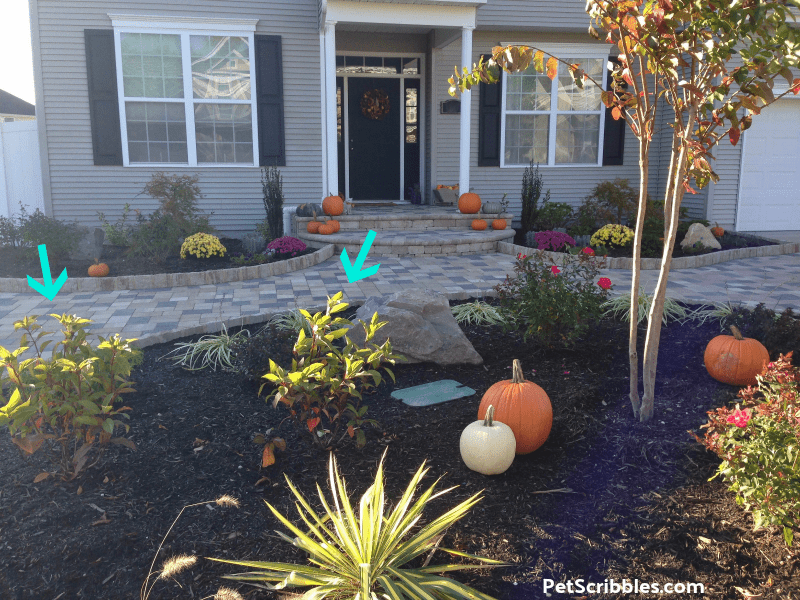 The arrows show the Pinky Winky shrubs, just one month after planting. There are two more planted on the other side of this large bed as well. 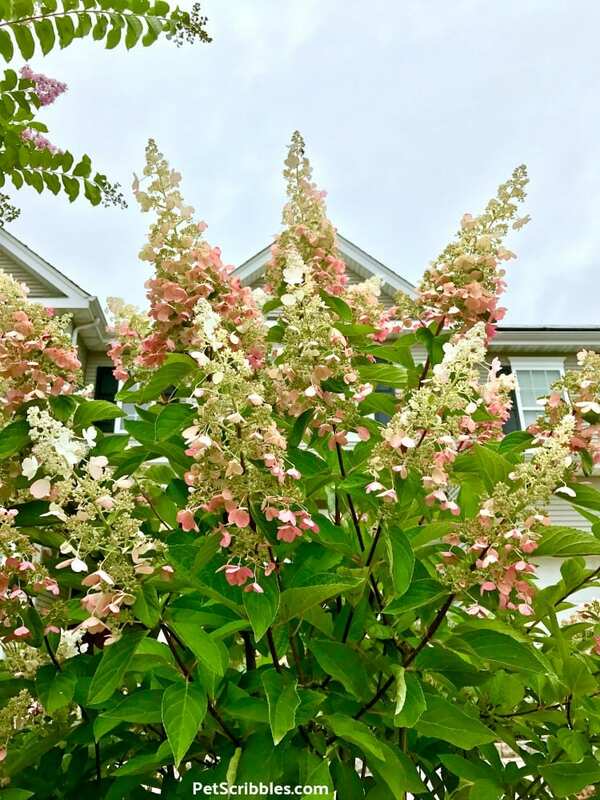 When to prune Pinky Winky Hydrangeas? The best time to prune your Pinky Winky hydrangeas is in the early Spring. 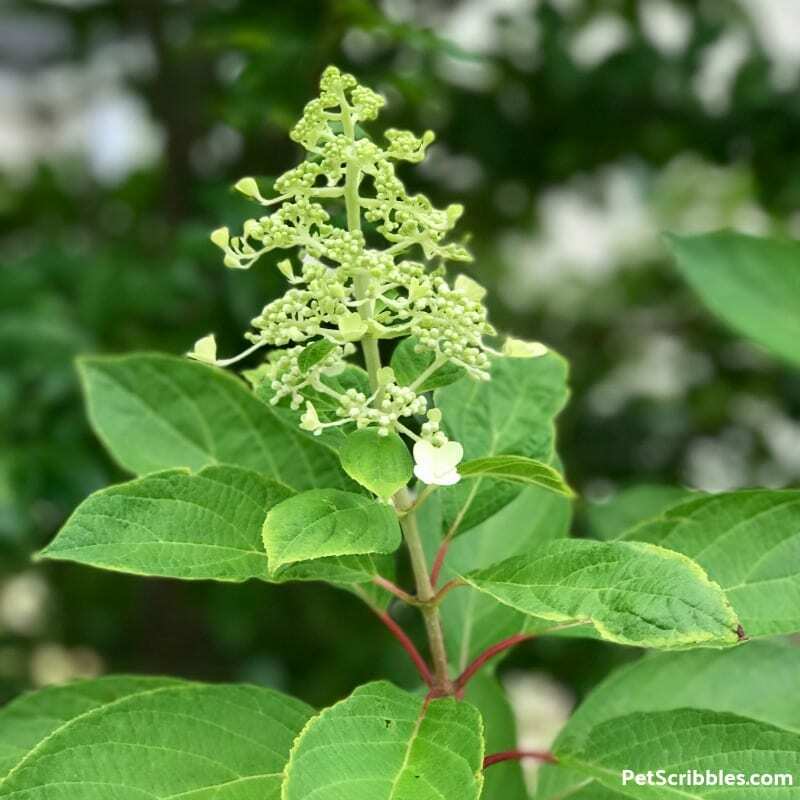 Pinky Winky hydrangeas bloom on new wood every year, so if you are cutting off brown twigs that have grown too high for your taste, don’t worry that you’re removing potential blooms. 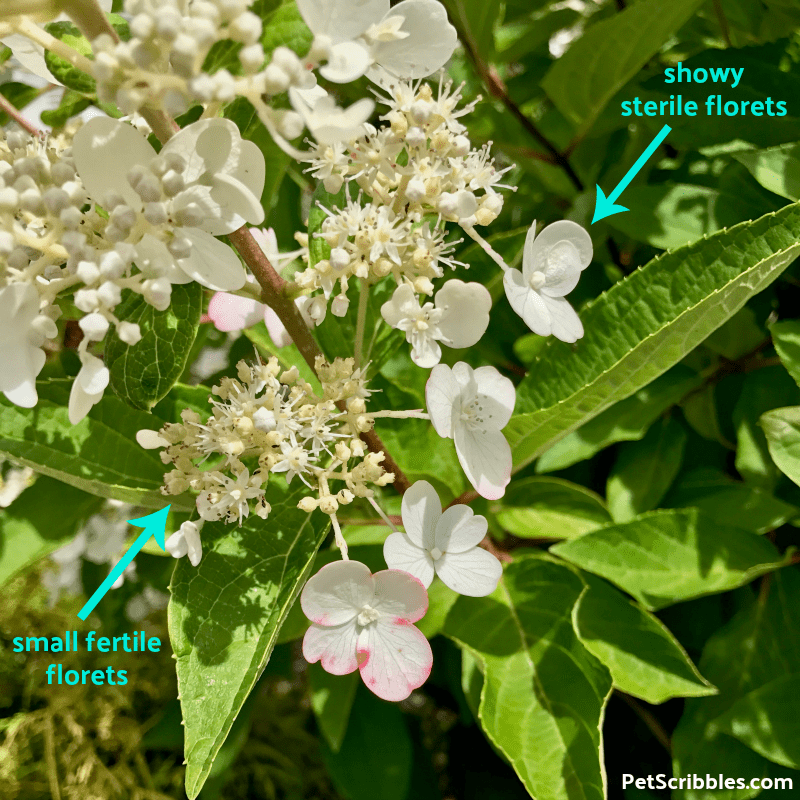 Here we go — instructions in a nutshell, so you can read this and get outside to prune your own Pinky Winky hydrangeas! Here’s what our Pinky Winky hydrangeas looked like in early Spring this year. Note: You can read about my favorite nitrile gardening gloves in my post here. I swear by these gloves! I like to leave the dried flower heads on our hydrangeas (all types) for Winter interest. Sometimes they end up being blown away by fierce winds, but mostly they stay on the plants and I like the look. Step One: Start at the end of a particular branch — and in my case it will be at the very tip of the flowers. 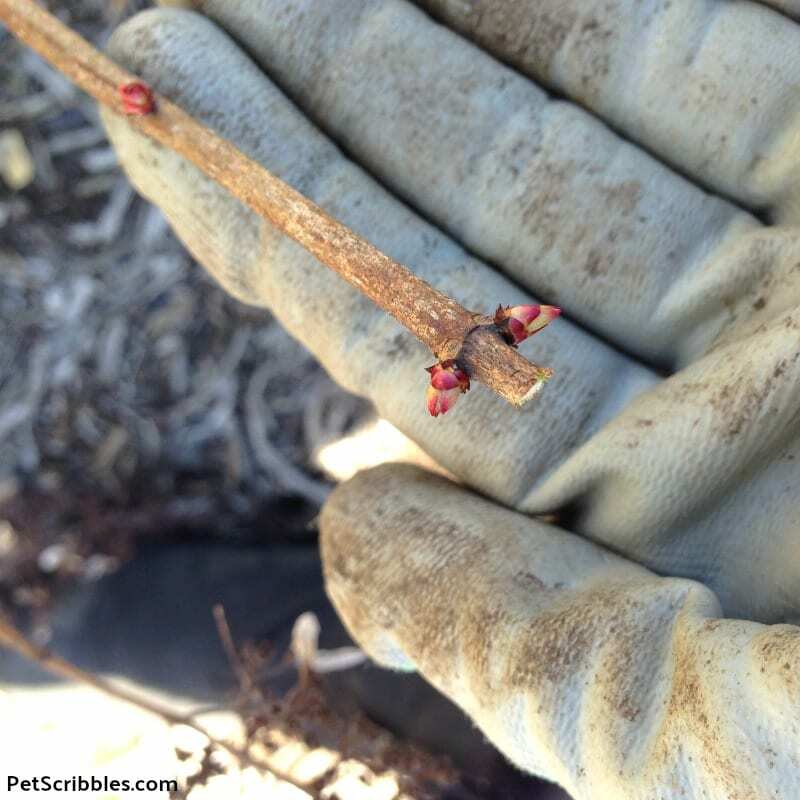 Step Two: Now follow the branch away from the tip until you see the first set of buds forming. Your eyes won’t have to travel down the branch very far. 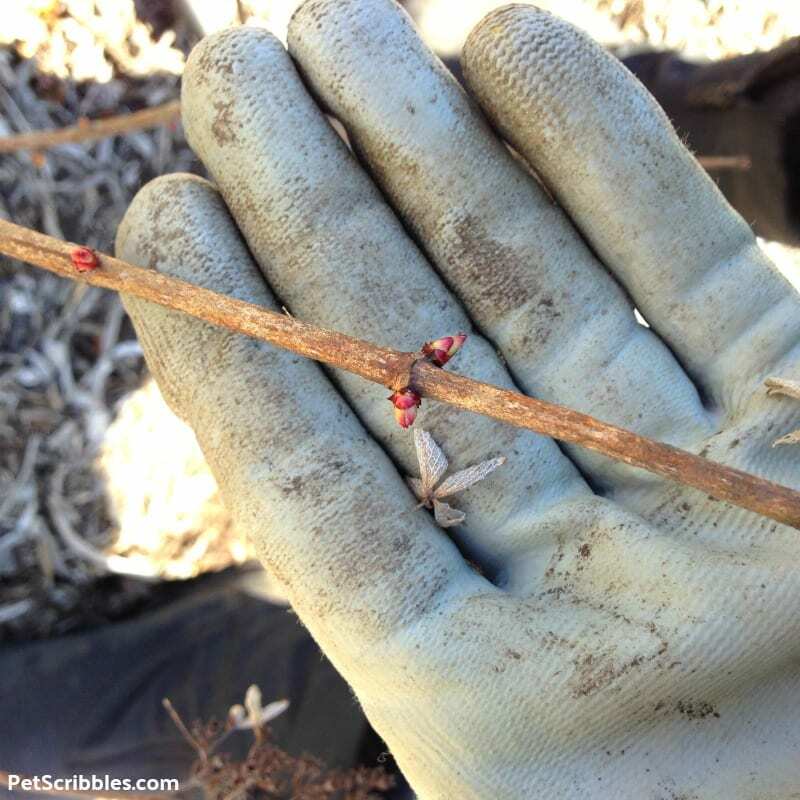 Step Three: Take your hand pruners and simply make a cut just above those buds. Didn’t I mention possibly no pruning is needed with Pinky Winky Hydrangeas? 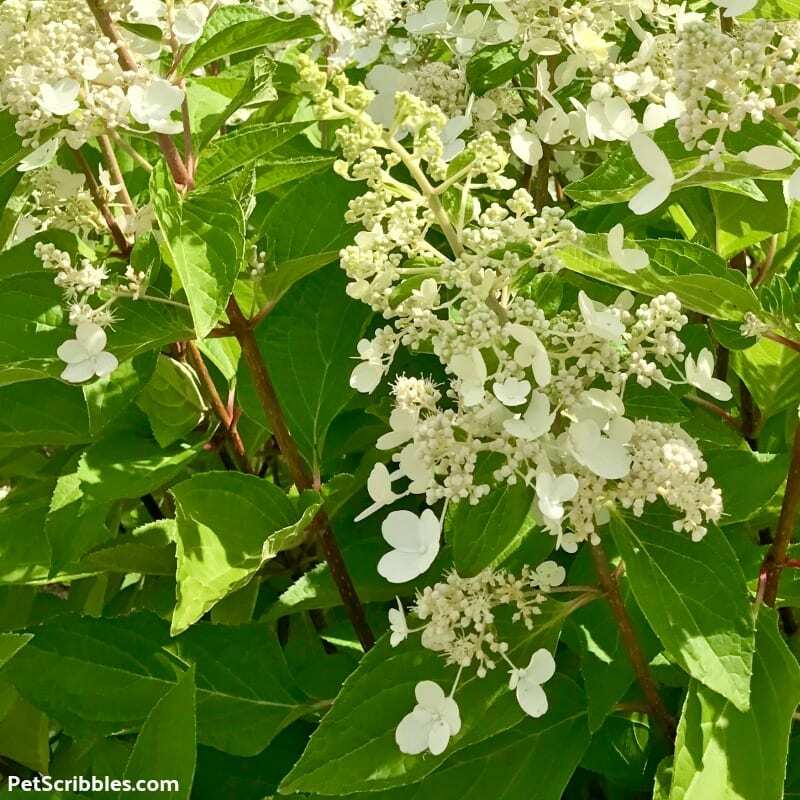 While you will come across many a garden book, online article or blog post on the internet about the precise way to prune Pinky Winky hydrangeas — such as pruning back certain branches in order to get larger blooms — I simply don’t have time for that. If you don’t want to prune your Pinky Winky hydrangeas, you honestly don’t have to. Many gardeners just prune a stray branch here or there to keep the shrub tidy. Or perhaps they prune any branches that are crossing (and touching), as that could cause the branches to begin rubbing against each other and some kind of bad, evil fungus could set in. And there are gardeners like me who will prune just like I showed you above. The point? It’s up to you! Try whichever way works best for you and then see how your hydrangeas do. That’s really all we can hope for, right? We try our best at taking care of our garden plants and shrubs, and over time we learn what works and what doesn’t quite work. Here’s what one of the Pinky Winky hydrangeas looks like just one month after being pruned. You can’t even see where I made any of the cuts, so all is well in my world! 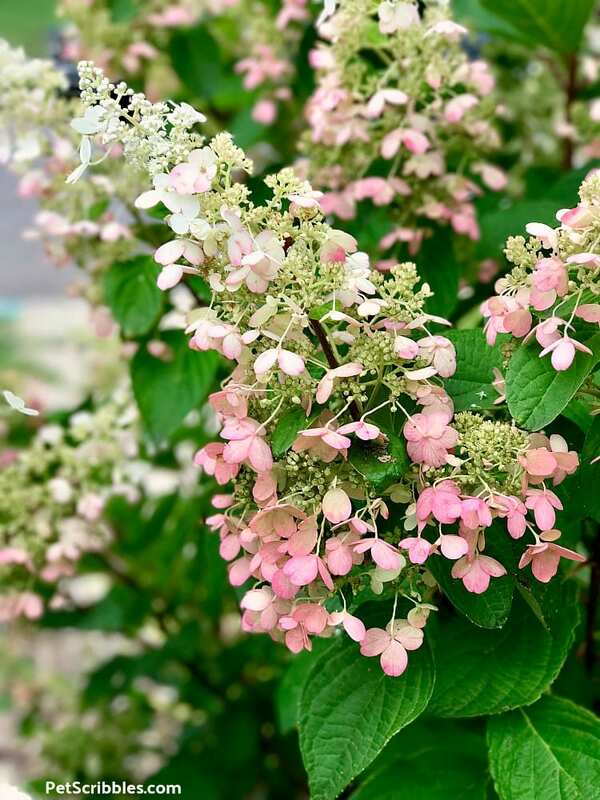 Personally, I think of Pinky Winky hydrangea as a four-season shrub. First, there’s bright green new growth in the Spring, followed by lime-green buds turning into white blooms. As the Summer continues, you get the pretty two-toned pink and white flower heads, which then continue to transform into a gorgeous rose color for the Fall season. 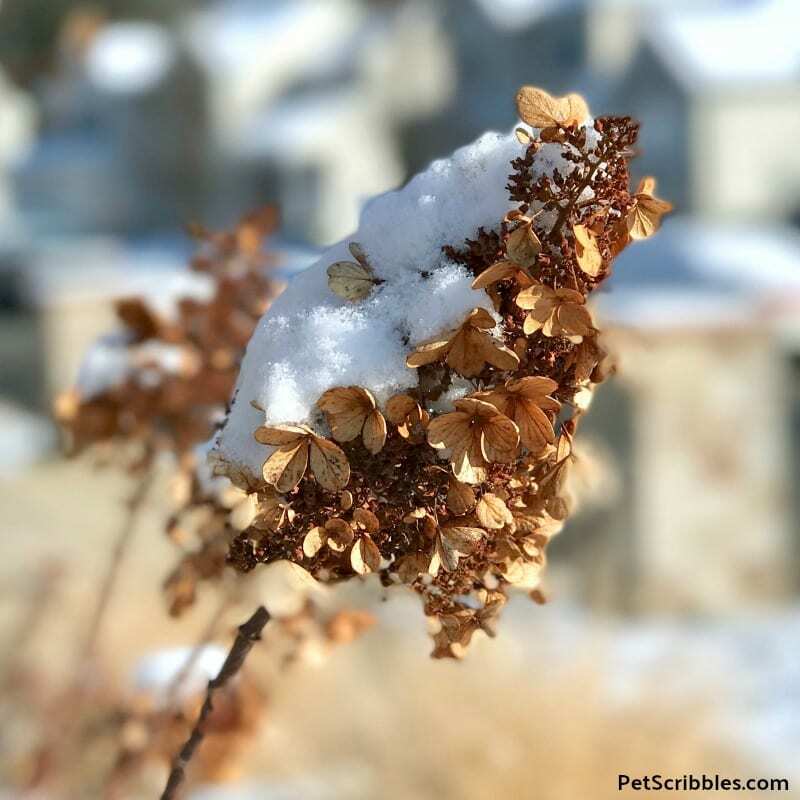 Finally, the dried flowers look so pretty in the Winter landscape, especially in the snow.